Small town life isn’t as peaceful as Logan Yates expected since taking a job with the Jamesville Police Department. He’s witnessed several odd occurrences, some of which might border on the supernatural if he believed in that sort of thing. But his real problem lies in figuring out who’s vandalizing his new home. He’s almost certain Kaylea Armund, his antagonistic college sweetheart, knows, but judging by the shadows darkening her eyes, she has no intention of sharing her secrets. A life-long resident of Jamesville, Washington, Kaylea Armund never bought into the legends and whispered tales about Spirit Woods, the primeval forest surrounding her hometown. Not once during her childhood did she see or hear anything strange from within the dark, shadowy depths of the forest. Growing up, she had worse things to deal with than mysterious lights and unexplained weather phenomena. But things take a turn into the strange and unexpected when Logan Yates—an old flame—brings a stray golden retriever into Kaylea’s clinic. She’s stunned by the dog’s resemblance to Max, her childhood companion. 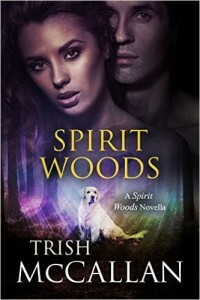 But when the golden recognizes her and knows all the tricks she’d taught her Max, a chilling question arises—if this dog really is the beloved family pet she’d buried beneath Spirit Woods’ canopy seventeen years earlier, what else might be making its way home from the grave?